This refers to EasyPHP 2.0b1 (which is current as of this writing), but hopefully applies to other versions too. Better yet, maybe the kind EasyPHP people will update EasyPHP as such. Of course, I make no guarantee that this will work for you. Install EasyPHP – it bundles PHP, MySQL and PHPMyAdmin. To install it, download it here. (For more info, visit EasyPHP.org.) Download and click on the *.exe file to install. EasyPHP comes packaged with a version of PEAR that doesn’t work. To fix it, right click here on go-pear.phar and save it to “C:\Program Files\EasyPHP 2.0b1\php5\PEAR” – overwriting the version that is already there. Now setup PEAR. Start up what I call the DOS prompt (not sure if this is still the name). Go to Start > Run and type in CMD. Then using DOS commands navigate over to “C:\Program Files\EasyPHP 2.0b1\php5”. Then type in “go-pear” to run the batch file go-pear.bat. No need to type in anything here, so just hit ENTER whenever you’re asked to do something. You’ll get an error message at the end saying something about php.ini. This is because EasyPHP hasn’t told PHP where to find PHP. So head on over to “C:\Windows\” and edit “php.ini” in your favorite text browser (I use EditPlus). Change line 509 (or thereabouts) from “. ;C:\php5\pear” to “C:\Program Files\EasyPHP 2.0b1\php5\pear\”. Congrats, you’ve now installed PEAR! But it doesn’t stop there. There are tons of PEAR add-ons. I recommend PEAR’s latest MySQL helper package called MDB2 (replaces DB). Installing is weird — it’s a DOS prompt thing. Go to “C:\Program Files\EasyPHP 2.0b1\php5\” and type in “pear install MDB2”. If you don’t want PEAR, all you have to do is install EasyPHP. But if you want to do anything serious, people smarter than me would recommend PEAR. So what exactly is this all about? We already know that Microsoft has joined our grass roots organization DataPortability.org (where I’m a co-founder), but are they serious? Yes, they are. Not that they are trying to be nice. Rather, they wisely view DataPortability as good strategy. Basically, if customers are leaving Microsoft because they are too proprietary, going more open is a way to keep and even grow their customer base. Hey Microsoft, welcome to DataPortability! A few days ago, I wrote a post entitled 5 Ways to Tackle Information Overload. Today I want to plot out current tools and what we can learn from their value and usability. I call this the “Relevancy Frontier”. While the exact positioning for each site is not the point, what the above shows is a wave of tools that are doing the best they can to make the internet more relevant while also being easy to use. If you agree with me, note that the newer services tend to be better than the older ones. I’d expect this trend to continue indefinitely, with some exceptions. Only services committed to constant innovation will survive. Google Reader (or any feed reader) is a great tool – as long as you can feed it relevant feeds. While Google Reader Recommendations now solves part of the problem, the issue with discovering relevant material is still a lot of work. The promise of APML via services like engagd and particls has great promise. While we need great algorithms to extract out APML, what we need even more is competition among services striving to make use of the APML. Related, DataPortability will provide further opportunities for increased relevancy and ease of use. Siphs is a lean and hungry startup that, among other things, has a social email tools, widgets, link blogs, and pretty much a lot of things. They’ve done a lot of great work with just two employees – and I expect more adaptation from them over the next years. Twitter is amazingly simple, but it’s very easy to choose relevant people to “follow”. This makes the simple stream of messages highly relevant. Speaking of being able to easily find relevant people to “follow”, LinkRiver does the same thing for link blogs. This site is only a few weeks old. A full review of all the sites is being the scope of this post. Rather than harp on the “dogs”, a common thread among the sites on the Relevancy Frontier are a spirit of continual innovation. Here is my response to the DataPortability video project. Do you suffer from information overload? Do you think finding a good article is more luck than skill? Here is the DataPortability timeline. For more information, visit DataPortability.org. To get involved in the conversation, visit DataPortability.Public.General. We also invite you to make your own video about What DataPortability Means to You. I’m sitting here at Panera (somewhat like Starbucks with real food) working on my laptop (which is nice but starting to fall apart). Just thinking……. Can a place like Panera or Starbucks come out with a “web incubator” concept. That is, there is seating room for 50-100 or so here. Lots come here to work on their laptop and drink up caffeine-laden beverages. Why not think of a place like this as a business? Maybe this is crazy, but maybe this would bread more productivity and entrepreneurialism. Drinking coffee and reading or listening to new trends is a great way to get inspired, to have visions of the future and motivated. So, assuming 100 “desks”, why not charge $250 per person per month. That’s $25,000 in rent per month, surely enough to cover real rent — and enough leftover to invest in some incubator-like support. This model could be advanced by assuming people are on some kind of meal plan. 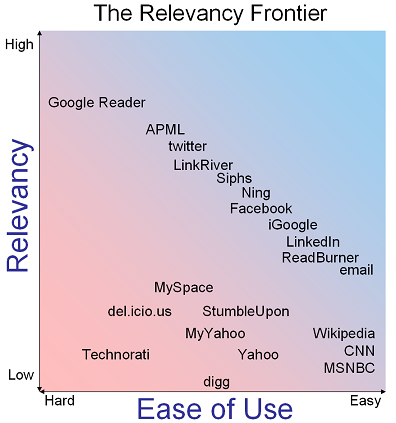 Just added a comment to Elias Bizannes’ blog in his article about APML and Google Reader. (My comment may not be live until he approves it.) He wrote the article back in October 2007 — and it is now February 2008. Since then, the APML buzz has blossomed into the much broader and very popular DataPortability movement. Hello from WordPress world. This is my first “real” post here. I’ve been so busy lately discussing DataPortability.org elsewhere that I’ve neglected my new little blog here at WordPress. I also have blogs on Typepad, Blogger, Edublogs (powered by WordPress) and elsewhere. I’ve heard so many good things about WordPress that I thought I’d try it out. Of course, one issue is that WordPress.com doesn’t allow the WordPress plug-ins that I’ve heard so much about. Right? If so, how ironic. Well, this was just a little entry to get my started here, a step beyond Hello World. Look for some real meat from me in the future here about DataPortability. Cheers.